Submitted by lynn on Saturday, September 19, 2015 - 11:00pm. 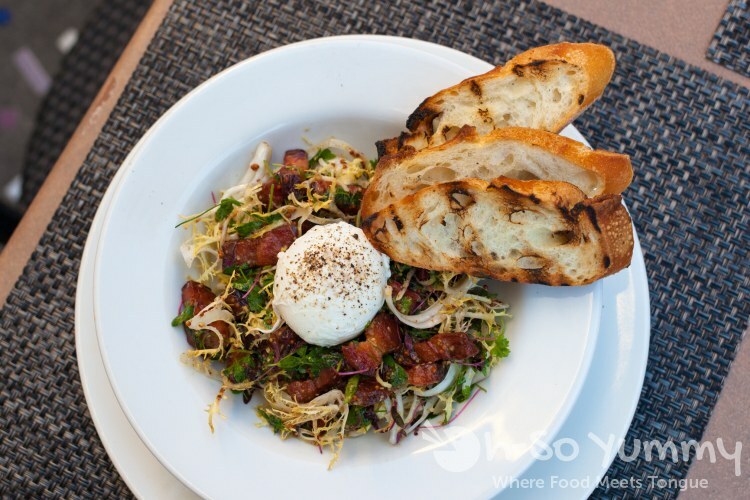 The biannual San Diego Restaurant Week is a promotion we look forward to due to our ever growing "to do" list of restaurants. 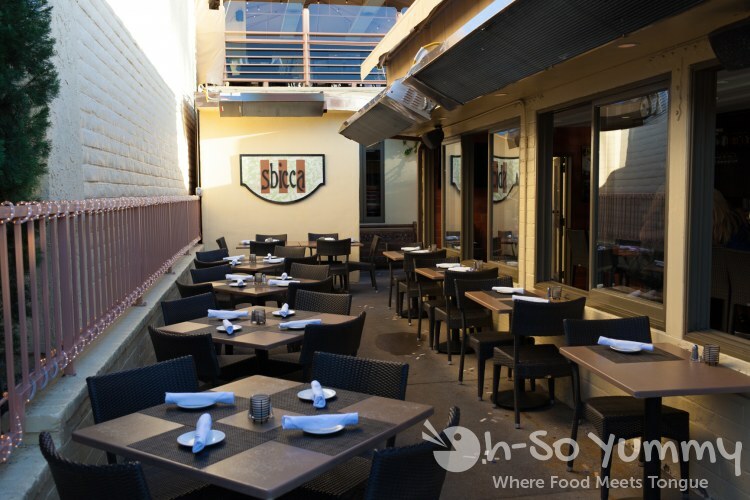 This year we were invited to preview the SDRW menu at Sbicca in beautiful Del Mar. This restaurant has been around for almost 18 years so they are doing something right! Sbicca is only a stone's throw away from the ocean. There's two main seating areas on the lower level plus an additional upstairs patio that provides a better view of the ocean. There was still some natural light outside so we chose to sit in this cozy side area. We were welcomed by Danny, the bar manager/assistant floor manager, and Amanda, the managing partner of Sbicca. We started the night right with the Strawberry Basil Lemonade cocktail, a drink special created for SDRW by Danny and Amanda. 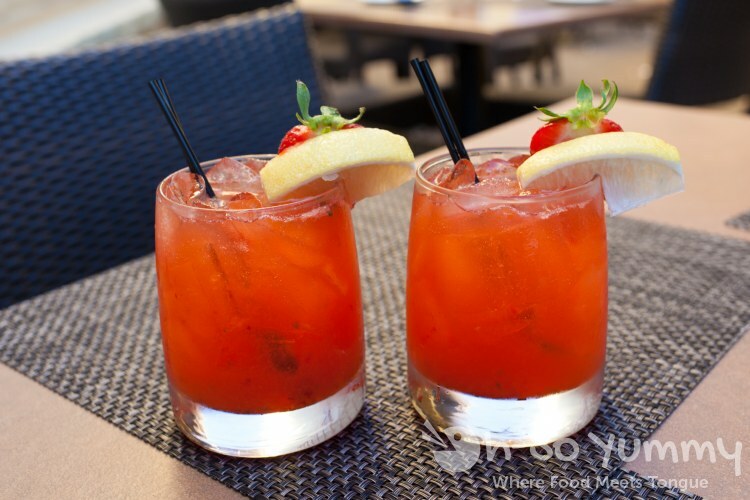 There's a noticeable hint of basil along with a strawberry puree base and it contains their house-made sweet & sour. I like how the alcohol taste is subtle. It tastes so good but I find these drinks can hit you unexpectedly if you have too many! We were amused to see the following text on under the Moscow Mule drink: "ID hold required for copper mug*. I can understand the concern... copper mugs are indeed awesome! We bought some for our own collection as well. 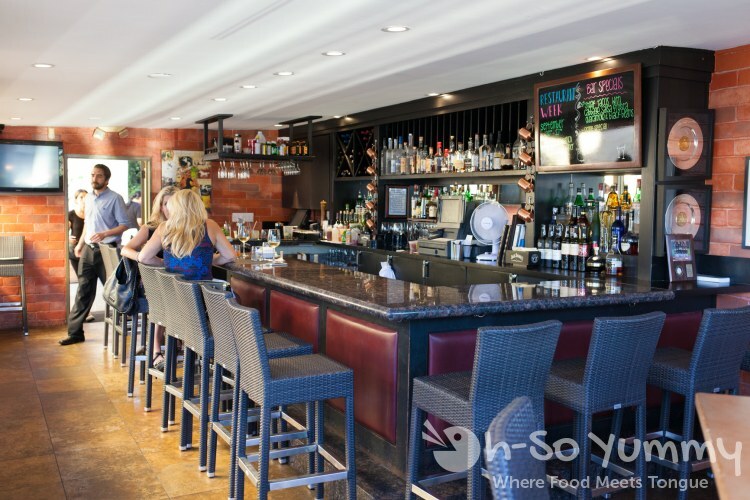 FYI, the restaurant also has a DAILY happy hour between 4-6pm in their bar area or in the front patio. Our waiter Logan took good care of us the rest of the evening and really knew the menu inside and out. We loved that he could describe everything as if it were in front of him! He was also humourous, especially when he spoke of gaining the L B's from all the delicious food there. I have a few L B's that I need to work on following all these yummy Taste events this year! Food began to come out and there was a spin on the complimentary appetizer basket. It had a roma salsa (as in roma tomato) to go with the country wheat and french baguette. The sauce was quite flavorful with some olive oil and light garlic. The two breads were soft and fluffy with a great chew to the crust. Next, two piping hot soup bowls were brought out to us. 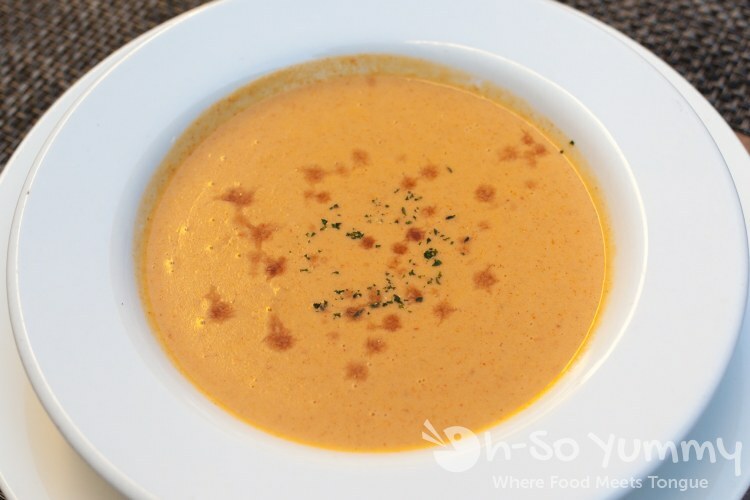 This was the famous Lobster Shrimp Bisque that had been made the same way for years! Good enough that you'd probably make the regulars cry if you removed it from the menu. 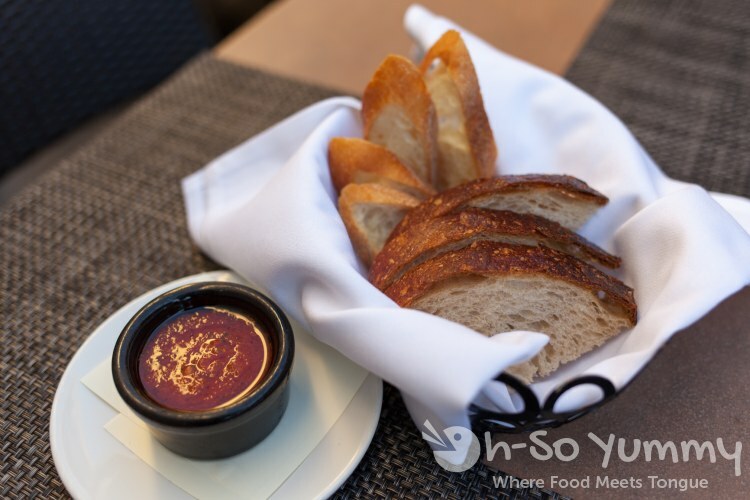 The bisque was creamy smooth and delicious with a touch of sherry on top and was a great starter. The Frisee Salad was the perfect size for an appetizer. We salivated over the "bacon lardons" which seemed to be super meaty smoky pieces of pork heaven. The mustard seed vinaigrette was in sync with the salad and I liked that it didn't have too much bite. A poached egg popped over all always rules in my book! We also tried the P.E.I Mussels. appetizer. The red curry broth was pleasant with some zest and a tiny bit of heat. I like how the mussels were immersed in the flavor too. At the end, my side plate was full of shells... I had eaten most of them myself! 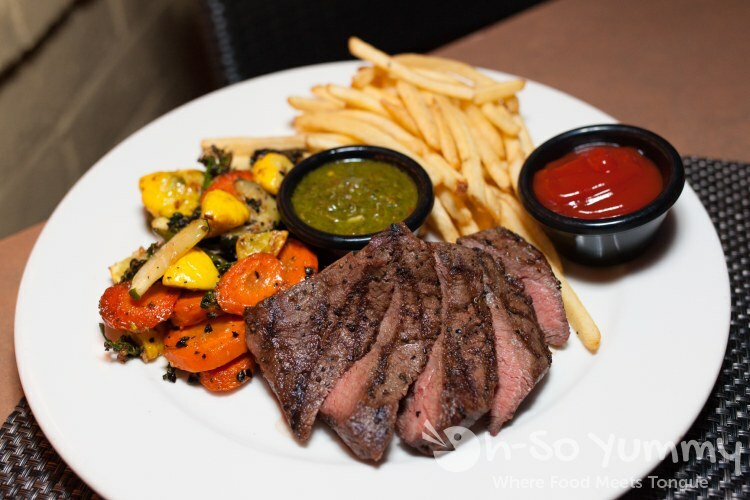 The Bistro Steak Frittes was one of our favorite entrees. The meat was seared to a beautiful medium rare and did not need any additional seasoning. There was a chimichurri sauce on the side but I could really taste the parsley, which I don't usually notice on others I've tried. Dennis didn't mind though and we both agreed that the steak was fabulous on its own. The vegetables seemed to be roasted with glorious garlic and seasonings. The fries were crispy thin and lightly salted. This was the Buttermilk Fried Jidori Chicken. Two pieces of fried chicken were stacked into a mini tower of food. The batter was light and crunchy but it could have used a tiny bit more salt to the meat. Underneath was a bounty of buttered corn and swiss chard surrounded by a mashed potato moat. The thicker consistancy potatoes were plain on their own but mixing it with the corn, chard or sage-cream demi did the trick for us. Mmmm. 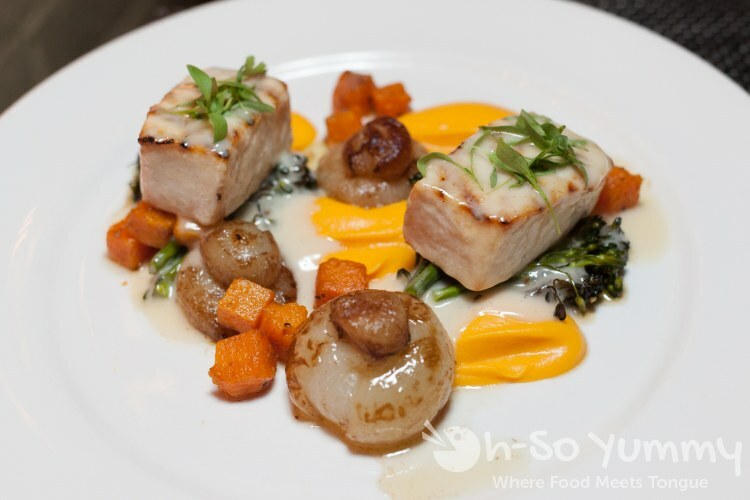 We aren't too familiar with swordfish so the Grilled Local Swordfish was another step in the right direction. The flesh was firm but still flaked away and was sauced with the lemon buerre blanc. I didn't care for the intense butternut squash puree on its own but it paired much better when eaten with the more mellow fish steak. I also devoured all the diced butternut squash bits if Dennis didn't get to them fast enough. We thought the cipolini onions were interesting the way they peeled away in layers from being roasted. I'm really liking the seasonal ingredients they put into this. We were only TWO people being fed THREE entrees plus appetizers so naturally, we had to take home a few leftovers! There's always room for some dessert, right? 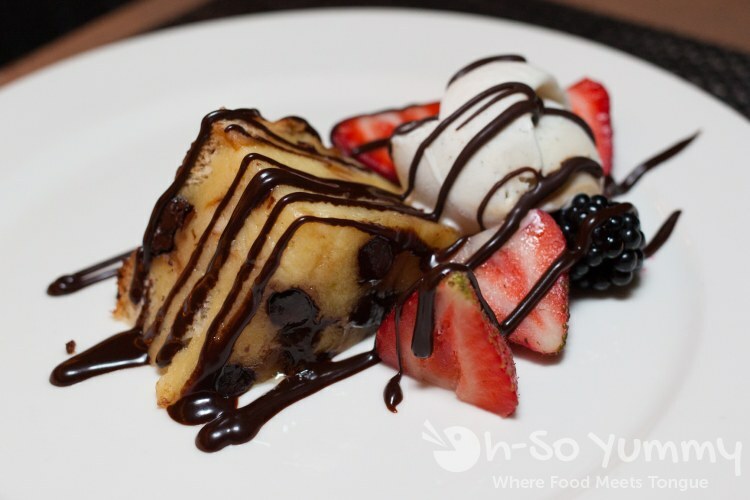 The Chocolate Chip Bread Pudding was warm and soft and served with a luscious Tahitian vanilla bean gelato. The fresh fruit on the side was a bonus! The Warm Fudge Brownie was chocolaty and moist and Dennis really enjoyed it. On top was a cappuccino gelato which contrasted in a fun way. We're not coffee drinkers though so I think those who do would appreciate it even more. We still ate every yummy bite. After finishing dinner, Executive Chef Harry came out to greet us. I actually met him briefly at the SDRW Launch Party and was excited to sample more of his handiwork (frisee, mussels, chicken, annd swordfish). 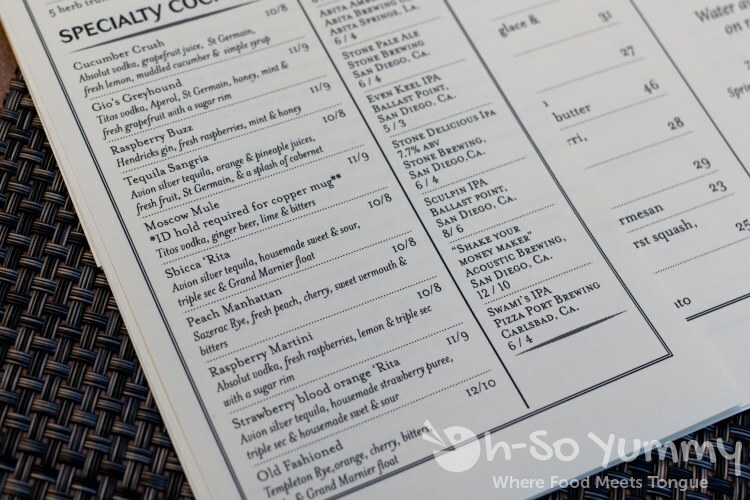 He's definitely putting some delectable items of his own onto the menu while maintaining the consistancy and quality of a few signature items. 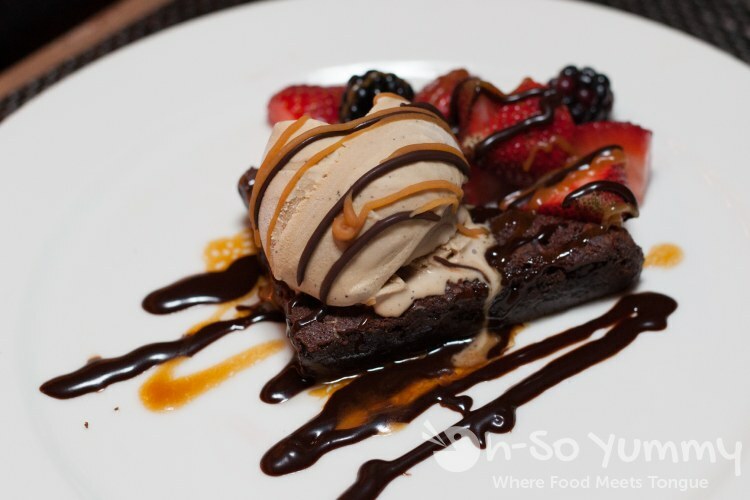 The desserts were created by Pastry Chef Nadia, who also works as a server, but wasn't there that night. 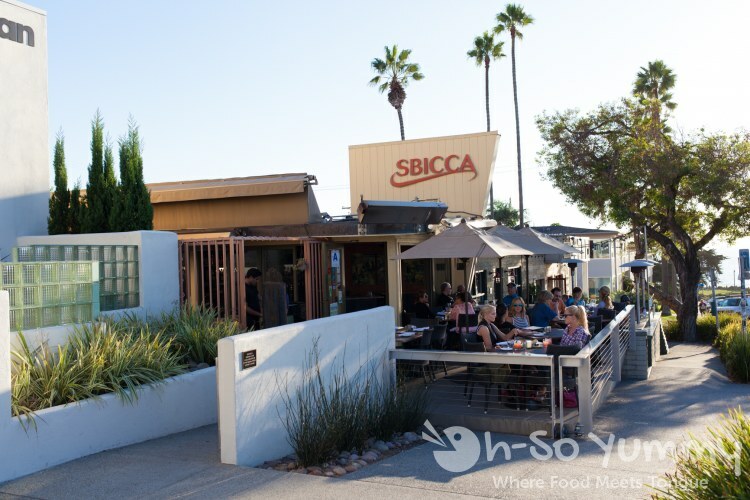 The whole team at Sbicca seemed close knit and happy and it shows in the quality of service and food you receive at this restaurant. The ambiance was really pleasant too and you can't say no to a place so close to the beach! During restaurant week, you can check out Sbicca's $20 pre-fixe lunch or $40 pre-fixe dinner (attached below). Disclaimer: We were hosted for this meal but the opinions are strictly our own. All photos by Dennis. 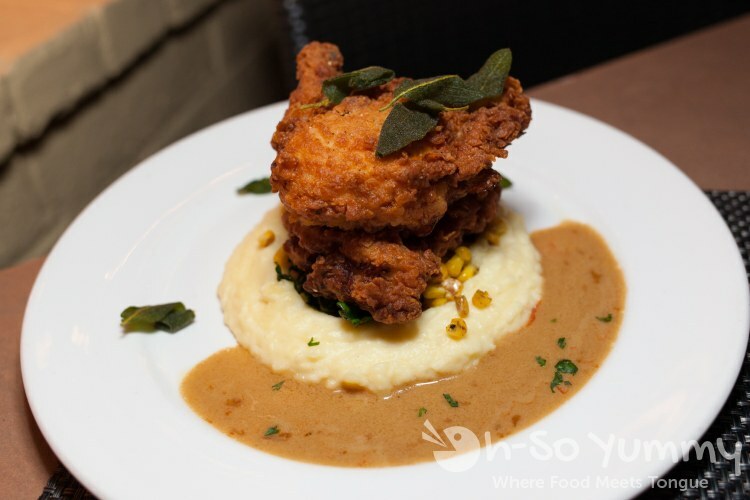 I love the plating on that fried chicken! It makes it look extra yummy in my book when things are plated so nicely. The sage cream demi also sounds heavenly to me. Really nice start for RW! Are there any other places you're planning to visit this week? 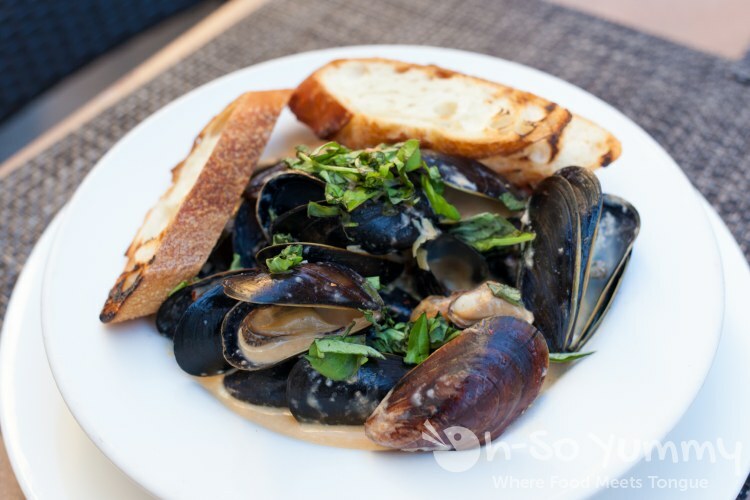 We always, always order mussels when we go out. We're on a search for the best in san Diego. And we just love them. :) Will check this one out for sure! This looks awesome! I will definitely have to try this out! I have never been to Sbicca before, but have passed it so many times and made a mental note to go there! Those lemonade cocktails sound right up my alley, and that brownie looks delicious. I was so sad that I missed celebrating Restaurant Week this year due to being out of town. I always find it so fun to try somewhere new during that week!